The following biographical information was written by Michael Houser, State Architectural Historian of the Department of Archaeology and Historic Preservation. It is from the Documentation and Conservation of the Modern Movement, Western Washington website (http://www.docomomo-wewa.org). 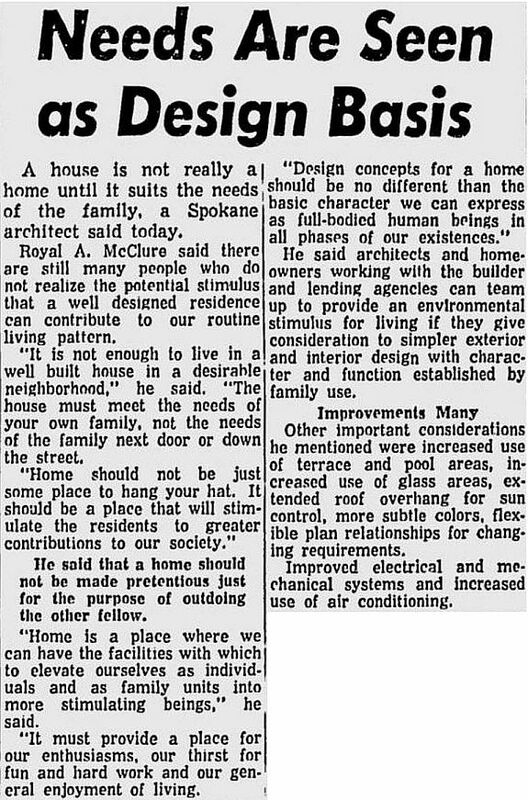 Born and raised in Spokane, Bruce Morris Walker, began his formal architectural training at the University of Washington in 1941. However, before completing school, he was drafted into the Navy during World War II and was sent to Midshipmen school. After being released from active duty in 1947, he completed his education and received his Bachelor’s degree in Architecture in June of that year. During school, Walker gained valuable experience by working for architect Bliss Moore in Seattle. Upon graduation, he returned home and went to work for a short time for architect E.J. Peterson and then for the firm of McClure & Adkison. 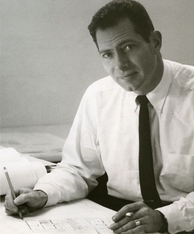 A gifted student, Walker continued his architectural education in Boston, and graduated with a Master’s degree from the Harvard Graduate School of Design in 1951. During school he worked for firm of Glazer & Gray in Boston, and for the Architects Collaborative. While in graduate school he won several national design competitions including first prize in a joint NAHB and Architectural Forum small house competition. After traveling and studying in Europe on the Appleton Traveling Fellowship, Walker returned to Spokane and opened his own practice in 1952. In 1953, he formed a lasting partnership with John W. McGough. Together, the firm pushed the architectural envelope in the Inland Northwest and created many award winning projects over the next 30 plus years. Benefiting from the post-war boom, the firm grew fast, designing many college and institutional facilities throughout the state of Washington. They also designed many residences, commercial buildings, and public facilities. 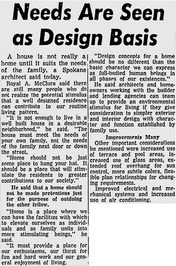 Notable projects include the Joel E. Ferris II House (1954); Ridpath Motor Inn (1963); Washington Mutual Savings Bank (1964); the Kamiak Apartments (1964) in Pullman; Stephenson Residence Center, Bldg. "D" Washington State University (1967); WSU Graduate Student Residence Hall (1971/1972); Farm Credit Banks (1969); Spokane Opera House (1974); Central Pre-mix Concrete Co Headquarters (1980); and the Metropolitan Financial Center (1982). Walker passed away in Spokane in April 2005 at the age of 81. Bruce Walker received $8,500 for winning first prize in the National Association of Home Builders and Architectural Forum Magazine small home design competition. There were 2,727 entries for the contest which closed on December 15, 1950. Walker was still attending Harvard's Graduate School of Design at the time. With part of that money he purchased a 1951 Studebaker Champion convertible. 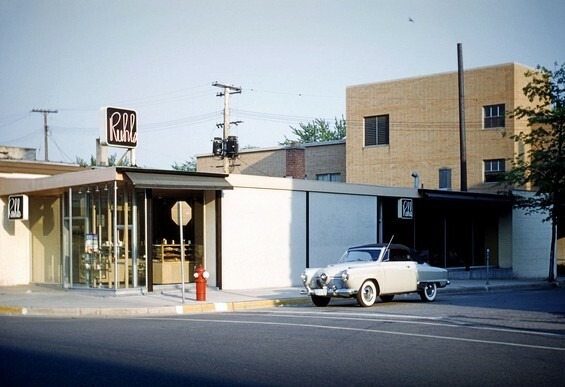 Above is Walker's new car in front of Ruhls Bakery in Birmingham, Michigan. This building was the first project designed by Minoru Yamasaki after starting his own firm in 1949. Yamasaki later designed the World Trade Center in New York and the Rainier Bank Tower in Seattle. 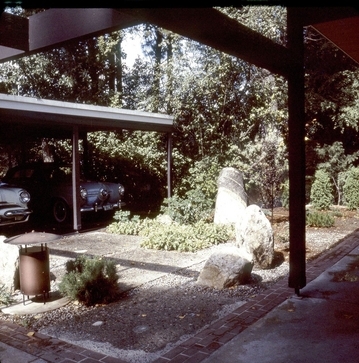 Here is the same Studebaker Champion convertible parked in the carport of the Ferris House. This picture was taken by Bruce Walker in August 1957 with a medium format Rolleiflex camera.